Who doesn’t love a cozy cabin in the woods? At Rip Van Winkle Campgrounds, our experience has helped us perfect what a quick night away or a family trip without a tent should be! Each of our cabins nestles up to the Plattekill Creek, so you can wake up every morning with a beautiful porch view of the famous creek. Equipped with heat, air conditioning, a miniature fridge, microwave and cable TV, guests find themselves right at home. When the weather is nice, take advantage of the outdoor picnic area, campfire ring and charcoal BBQ grill. 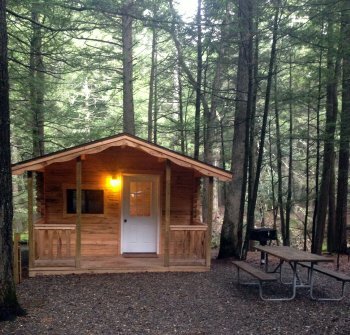 Built for four, our cabins will have you enjoying our fully wooded campground in no time. Be sure to bring along your favorite bed linens and pillows and you'll have exactly what you like for a long, restful vacation in the woods. Cabins are a very short walk from the swimming hole, the bathrooms and the playground. Perfect location, perfect amenities, perfect vacation! Call today to reserve 1-888-720-1232 or reserve online.